Peptide (C)NSTGIINETSDHSE, corresponding to amino acid residues 747-760 of human TRPA1 (Accession O75762). 1st extracellular loop. Homology Bovine - identical; canis - 13/14 amino acid residues identical; rat - 12/14 amino acid residues identical; mouse - 9/14 amino acid residues identical. 1,3,4. Anti-TRPA1 (extracellular) Antibody (#ACC-037), (1:200). 2,5,6. Anti-TRPA1 (extracellular) Antibody, preincubated with the control peptide antigen. Human urethra (1:2000) (Gratzke, C. et al. (2009) Eur. Urol. 55, 696.). 2. PC-12 lysates + Anti-TRPA1 (extracellular) Antibody (#ACC-037) (6.5 µg) + protein A beads. 3. Anti-TRPA1 (extracellular) Antibody + protein A beads. Immunohistochemical staining of rat dorsal root ganglion (DRG) using Anti-TRPA1 (extracellular) Antibody (#ACC-037) (1:200). A. TRPA1 staining (green) is detected in both cells (horizontal arrow) and processes (vertical arrow). B. Nuclear staining using DAPI as the counterstain. C. Merged image of A and B. Human urethra (1:500) (Gratzke, C. et al. (2009) Eur. Urol. 55, 696.). Cell surface detection of TRPA1 in intact living rat PC12 cells. 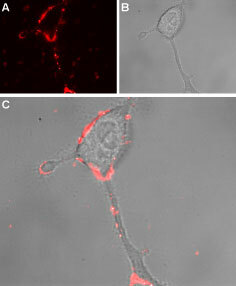 A. Extracellular staining of cells using Anti-TRPA1 (extracellular) Antibody (#ACC-037), (1:50) followed by goat anti-rabbit-AlexaFluor-594 secondary antibody (red). B. Live view of the cells. C. Merged image of A and B.
Sotomayor, M. et al. (2005) Structure 13, 669. Clapham, D.E. (2002) Science 295, 2228. Originally, it was thought that TRPA channels sensed painfully cold temperatures,2 but a more conservative description is that TRPA1 is sensitive to membrane/cytoskeletal perturbations caused by low temperatures3-5 and perhaps stretch.6 In addition, it is sensitive to pungent natural compounds present in cinnamon oil, mustard oil, and wintergreen oil. Expression of TRPA1 in rat DRGs. Immunohistochemical staining of rat DRG sections using Anti-TRPA1 (extracellular) Antibody (#ACC-037). 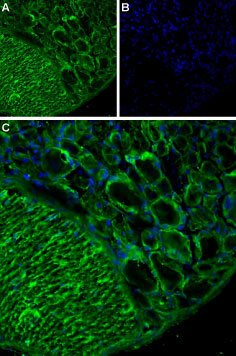 TRPA1 staining (red) is detected in DRGs and co-localizes with IB4 staining (green).Adapted from Yamamoto, K. et al. (2015) Mol. Pain 11, 69. with permission of BioMed Central. Anti-TRPA1 (extracellular) Antibody (#ACC-037) is a highly specific antibody directed against an epitope of the human protein. The antibody can be used in western blot, immunoprecipitation immunohistochemistry, and live cell imaging applications. It has been designed to recognize TRPA1 from mouse, rat, and human samples. Yamamoto, K. et al. (2016) Mol. Pain 11, 69. Mouse cerebral and cerebellar arteries lysate (1:500). Also tested in TRPA1 knock out mice. Sullivan, M.N. et al. (2015) Sci. Signal. 8, 358. Gratzke, C. et al. (2009) Eur. Urol. 55, 696. Mouse cerebral and cerebellar arteries lysate 2 μg. Also tested in TRPA1 knock out mice. Yamamoto, K. et al. (2015) Mol. Pain 11, 69. Weinhold, P. et al. (2010) J. Urol. 183, 2070.